The United Launch Alliance (ULA) successfully launched the US Air Force’s sixth Block IIF GPS satellite atop a Delta IV rocket on Friday. Liftoff from Space Launch Complex 37 (SLC-37) at Cape Canaveral Air Force Station was on at 8:03pm local time, following a 24 hour scrub turnaround due to very poor weather on the Space Coast during the first attempt on Thursday. The chance of acceptable weather on Thursday was rated at only 30 percent, eventually resulting in the scrub being called due to the violation of multiple weather criteria. The scrub was called with around one hour remaining in the launch countdown. The launch was rescheduled for Friday, with a launch time of 8:03 p.m. EDT. The forecast for Friday was – as expected – much improved on Thursday, with a 90 percent chance of favorable weather conditions for the launch. The payload, GPS IIF-6, forms part of the Global Positioning System: a constellation of navigation satellites operated by the United States Air Force but available for use by civilian and military users around the world. GPS uses a network of twenty four satellites broadcasting time-coded signals which a receiver can use to triangulate its position. The launch of GPS IIF-6 marks the halfway point in a series of interim satellites intended to introduce new services and capabilities, along with greater navigation accuracy, ahead of the third-generation GPS constellation beginning to enter service in 2016. The GPS IIF spacecraft are being built by Boeing. In total twelve are planned, with each satellite having a mass of around 1,630 kilograms (3,530 lb) and a design life of twelve years. The GPS IIF-6 satellite is also known as GPS SVN-67 and will transmit Pseudo-Random Noise (PRN) signal 06. The GPS satellite constellation is divided into six planes, designated A to F, each containing four operational satellites and ideally a fifth as a spare. Additional, older, satellites are generally also available in each plane for use in an emergency. IIF-6 is bound for plane D, where it will serve in slot 4, replacing the USA-96, or GPS II-26/IIA-14 satellite launched on 26 October 1993 atop a Delta II rocket. This twenty-year-old satellite, which broadcasts PRN 04, is among the oldest in the GPS system. All of the GPS satellites currently in service are part of the second-generation constellation which began launching in 1989. The eleven first-generation satellites were never intended to be part of the operational constellation, instead being used to test the concept of a global navigation satellite system. 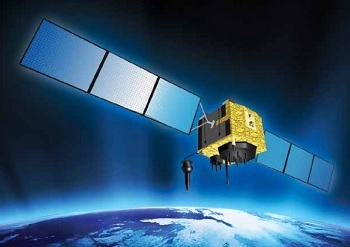 Within the second-generation, or Block II, constellation, the satellites have been updated or redesigned several times to improve their capabilities. 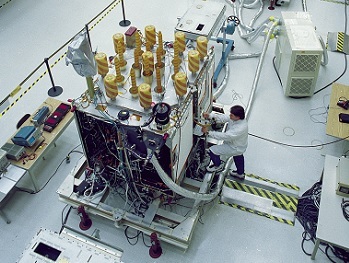 Nine Rockwell-built GPS II satellites, deployed between February 1989 and October 1990, are now all out of service, while a tenth spacecraft was never launched. With the availability of the more powerful Delta II 7925 rocket, the improved GPS IIA spacecraft were introduced with nineteen launching between 1990 and 1997 to complete the initial operational constellation. Lockheed Martin was contracted to build twenty one Block IIR spacecraft, intended to replenish the constellation as older satellites approached the end of their service lives. The first of these, SVN-42, was lost in the January 1997 failure of the Delta II rocket. Despite this setback, the next twelve spacecraft were launched successfully , with the following eight being upgraded to the IIRM specification. The final IIRM launch took place in August 2009 when the final Delta launch from Space Launch Complex 17A lofted USA-206 (GPS IIR-21/IIRM-8). The first Block IIF satellite, USA-213, was launched the following May, with four more satellites joining it in orbit – the most recent this February atop the previous Delta IV launch. GPS Block IIF spacecraft are capable of being launched atop Delta IV or Atlas V rockets; for launch a Delta IV Medium+(4,2), flight number Delta 366 (D366) was used. Each GPS deployment mission is named after a star; for GPS IIF-6 it is Rigel, after the brightest star in the constellation Orion. 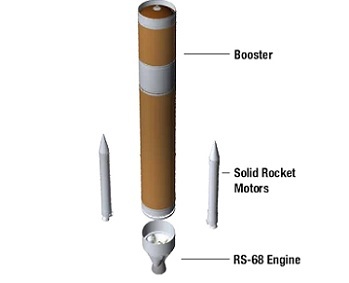 The first stage of the Delta IV, the Common Booster Core, is powered by an Aerojet Rocketdyne RS-68 engine. Making its fortieth flight, including the uprated RS-68A variant, the RS-68 was developed specially for the Delta IV. It burns cryogenic propellant; liquid hydrogen oxidised by liquid oxygen; to produce 2.95 meganewtons (301,000 kgf or 663,000 lbf) of thrust at sea level. 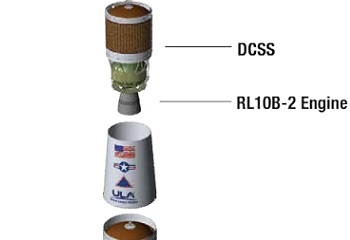 The second stage, the Delta Cryogenic Second Stage (DCSS), sits atop the CBC and is powered by a single RL10B-2 engine, which burns the same propellants as the RS-68. At liftoff, two solid rocket motors are present to augment the thrust of the first stage. The Delta IV can fly in five different configurations, depending upon mission requirements. The smallest, the Delta IV Medium, has no solid rocket boosters and a four-metre upper stage. Due to its low payload capacity, the Medium has only made three flights, the most recent in 2006. The next configuration is the Medium+(4,2), which is being used for the mission. This features two solid rocket motors attached to the CBC, with the stage undergoing internal modifications to accommodate the motors. Two other Medium+ configurations exist, each using the expanded five-metre upper stage developed for the Delta IV Heavy. The Medium+(5,2) has two solid rocket motors attached to the first stage while the Medium+(5,4) has four. Finally, the Delta IV Heavy uses two additional Common Booster Cores to provide additional thrust at liftoff in place of the solids. Currently the largest and most powerful rocket in America’s launch fleet, it has flown seven times with its eighth planned for later this year when it will carry NASA’s Orion spacecraft on its first test flight. The launch began with the ignition of the Delta IV’s RS-68 engine five seconds in advance of the planned liftoff. Upon the countdown reaching zero, the two solid rocket motors also ignited, propelling the rocket from its launch pad. Eight seconds into flight, Delta 366 began a series of pitch and yaw manoeuvres to attain the planned trajectory for its ascent into orbit. 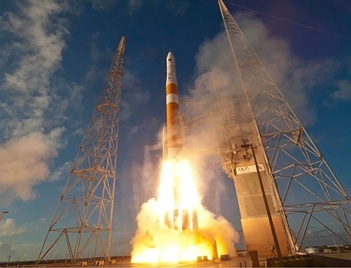 Flying on an azimuth of 45.55 degrees, the Delta IV reached the speed of sound 47 and a half seconds after lifting off. It passed through the area of maximum dynamic pressure 13.2 seconds later. The solid rocket motors, a pair of Alliant Techsystems GEM-60s, burned for a minute and 34.6 seconds, with separation taking place 5.4 seconds after burnout. With the solids gone first stage flight continued solely under the power of the RS-68, which continued burning until four minutes and 7.2 seconds after liftoff. After a 7.3-second coast, the spent Common Booster Core was jettisoned from the second, which ignited its RL10 engine fifteen seconds later to continue its journey. 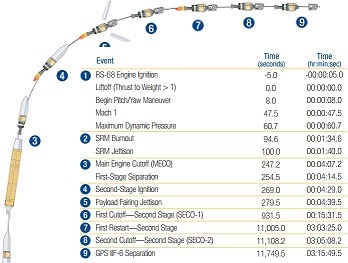 Separation of the payload fairing from around the GPS IIF-6 satellite took place ten and a half seconds after the second stage engine ignites, with the burn itself taking eleven minutes and two and a half seconds to complete. At the end of this phase of powered flight, the second stage and payload will be in a transfer orbit. As it approaches apogee, around three hours, three minutes and 25 seconds after liftoff, the second stage restarted its engine to perform a circularisation burn. Much shorter than the first burn, this saw the engine fire for 103.2 seconds to attain the planned separation orbit. Ten minutes and 41.3 seconds after the end of this burn, the GPS IIF-6 satellite, which is expected to be renamed USA-251, separated from the Delta IV into its medium Earth orbit. The expected orbit at spacecraft separation is roughly circular at an altitude of 20,500 kilometres (12,700 statute miles, 11,050 nautical miles) and an inclination of 55 degrees. At this altitude the spacecraft will orbit the Earth once every twelve hours, completing two revolutions per day. Delta 366 launched from Space Launch Complex 37B (SLC-37B) of the Cape Canaveral Air Force Station. 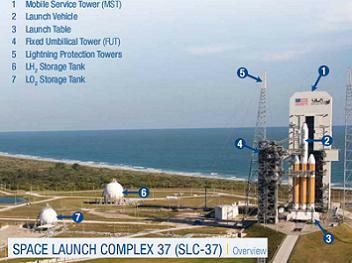 The modern SLC-37 was constructed in the late 1990s and early 2000s, and consists of a single pad. It was built on the site of the original Launch Complex 37, which had been used for test launches in the early stages of the Apollo programme. Although the original complex consisted of two pads – LC-37A and 37B, pad A was never used for a launch. 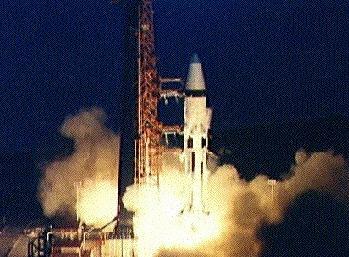 The first mission to lift off from Pad B was SA-5, the first orbital launch of the Saturn I rocket, on 29 January 1964. All six orbital Saturn I launches took place from LC-37B – while Launch Complex 34, which had supported its suborbital test flights, was upgraded for manned launches using the Saturn IB. Two unmanned Saturn IB missions also flew from LC-37; SA-203 tested the S-IVB stage’s restart capability while Apollo 5 demonstrated the Lunar Module in Low Earth orbit. Following these missions, the focus of the Apollo programme shifted to Saturn V launches from Complex 39. The Saturn IB pads at LC-34 and LC-37 were placed into storage, ahead of planned use in the 1970s for the Apollo Applications programme. After Apollo Applications was scaled-back to consist of only the Skylab space station and later the Apollo-Soyuz Test Project, the older pads were surplus to requirements with LC-39 being modified – by means of the “milkstool” adaptor atop Mobile Launcher 1. The old Launch Complex 37 was demolished during the 1970s having been used for eight launches. Since the new pad was built, it has been used for twenty launches beginning with the Delta IV’s maiden flight in 2002. That launch lofted the Eutelsat W5 spacecraft, which has since been renamed Eutelsat 25C. This remains the only commercial satellite launched atop a Delta IV, as the rocket is used almost exclusively for military payloads. The twenty-first Delta and twenty-ninth rocket overall to fly from SLC-37, the launch marked the Delta IV’s twenty-sixth mission and the second of the year. Delta 366 was the eighth American rocket to launch in 2014, with five of those launches being made by ULA. Formed in 2006 from the merger of Boeing and Lockheed Martin’s military launch business, United Launch Alliance supplies Evolved Expendable Launch Vehicle and Delta II missions to customers in the United States government, as well as being subcontracted by Lockheed and Boeing for commercial launches. ULA’s next launch is expected next week, when an Atlas V will loft the NROL-33 mission for the National Reconnaissance Office. The next Delta mission will be a rare outing for the venerable Delta II in early July, which will deploy NASA’s Orbiting Carbon Observatory 2 satellite. The Delta IV will next be in action later the same month, carrying out the AFSPC-4 mission which involves deploying a pair of GSAAP surveillance satellites and the ANGELS technology demonstrator. 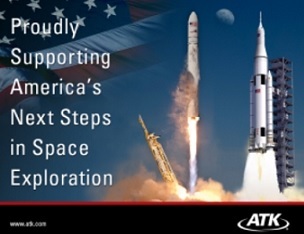 The next GPS launch, which will make use of an Atlas V, is also expected to occur in July, with a further satellite launching on another Atlas in October.